I am not sure when the people of Egypt became more worldly than the people here in America but it would seem they have it figured out. 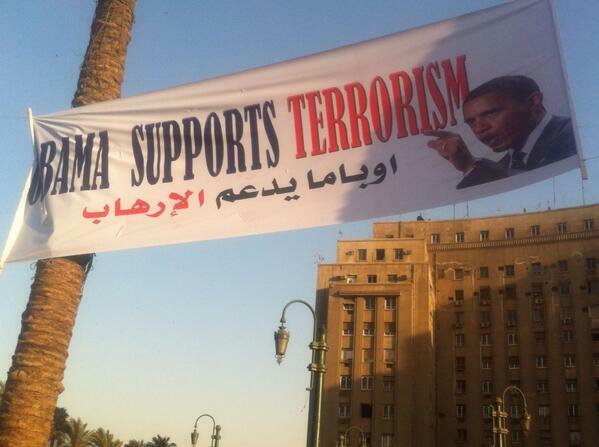 Betsy Hiel tweeted a picture of a banner that has been hoisted in Tahrir Square that reads “Obama Supports Terrorism” in both English and Arabic. The banner has been placed in preparation for Sunday’s scheduled protests against Mohamed Morsi and The Muslim Brotherhood. 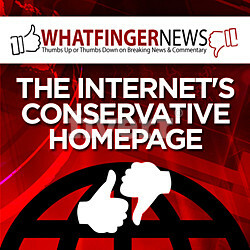 More information concerning the blatantly pro-Brotherhood position of the United States continues to emerge. Earlier, U.S. ambassador to Egypt Anne Patterson exposed the Obama administration’s allegiance when she urged Egyptians—including the beleaguered Christian Copts—not to protest against the Muslim Brotherhood as planned for June 30. A couple of days ago news broke that Mohamed Morsi, president of Egypt, has been tied to Benghazi by some leaked intelligence documents. There is growing evidence that Benghazi was likely a failed prisoner exchange to trade Ambassador Stevens for The Blind Sheik. Does Obama support terrorists? You tell me. How is it that Anti-Muslim Brotherhood/Anti-Morsi protesters in Egypt are smarter than 80% of the people in this country? It’s because Obama is not the only person in America who supports terrorism. You need to look very hard at media sources and 535 elected officials. With all of the mountains of evidence, none of them are even asking about Morsi’s ties to Benghazi. They save that sort of thing for guys like me and then they call me a conspiracy theorist. Yet I guarantee you that many truth-seeking bloggers, like myself, have uncovered more evidence than any of those tough as nails Representatives who dance in circles like nancies begging whoever is on the stand to answer a simple question. While they waste their time interrogating General Carter Ham, there are a lot of us out here who are looking for answers from the Arab world. You will not get real truth from anyone in our top levels of government. They can not be trusted. I feel the same way about the media. With the exception of a few right-wing sources (but certainly not all of them) there is very little reporting about who might have actually been responsible for the murder of four Americans in Benghazi. They are proving more so every day that we live with a state controlled media. The article is full of links to past articles and it details the case that has been built tying your President and Hillary Clinton to a terrorist named Mohamed Morsi who just happens to be the President of Egypt. Or you can go back to your Cheetos too. You can always wait to learn about the terrorist ties. Habib may show up at your door someday and offer you a personal lesson.